It was two years ago on 07-MAR-13 that I was diagnosed with Type 2 Diabetes and I labeled it as a life changing moment but at that time I had no idea how much my life would truly change! I don’t think anyone is truly “comfortable” with change but I am hard wire to be a quick adopter to change and adapt quicker than others. Some might view that as a weakness because I can be seen as unpredictable and willing to alter core beliefs to match the prevailing winds. But I view myself as someone who is quick to obtain the right data, analyze it and course correct to take advantage of the new landscape. It took me a couple of days to come to grips with this major disease that I now had the unfortunate pleasure of living with but make no mistake about it, I fully accepted this disease and was determined to not let it beat me. I told my endocrinologist at our first meeting that my goal was to die of something unrelated to diabetes. It should be noted that my Type 2 Diabetes diagnosis was not “borderline” but very serious. 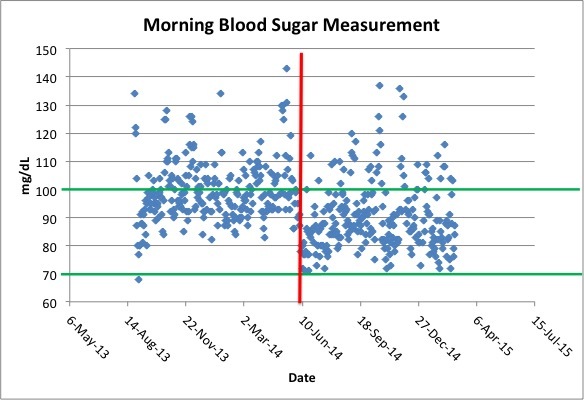 A person without Type 2 Diabetes will have morning (fasting) blood sugar measurements in the 70-100 mg/dL range and my measurements were around 350 mg/dL. I was in the fast lane to a very long and painful death – nerve damage, losing my eyesight, amputation of extremities, kidney damage and heart disease. For a person who doesn’t take seriously his Type 2 Diabetes diagnosis, the end game is very bad. My first plan of action was to reverse the deleterious lifestyle choices I had made a couple of years prior to my diagnosis which amounted to resuming my regular running/exercise routine and making better food choices. Those choices, along with the medicine my doctor prescribed (Janumet) did improve my situation as I wrote about here. 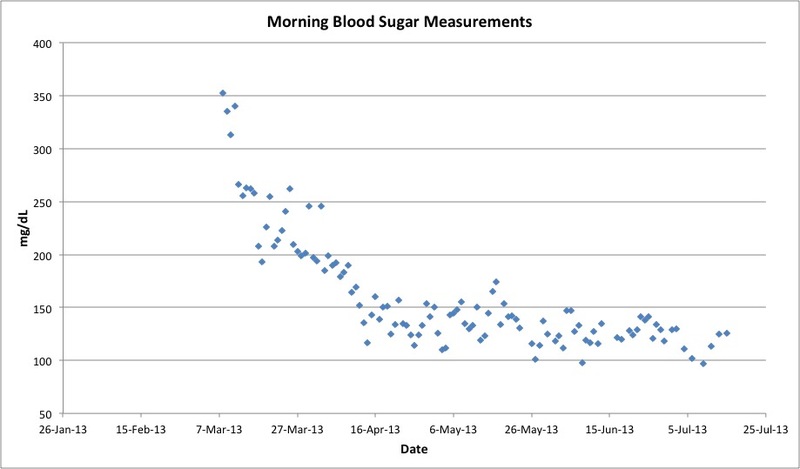 After 4 months on my new routine, my morning blood sugar measurements did come down to the “normal” range for a Type 2 Diabetic (below 120 mg/dL) as you can see from the graph below and I lost 10 pounds of the 25 pounds that I needed to lose (as compared to my lowest adult weight when I was in my 30’s and running 5 times a week). But that wasn’t enough for me. I hated taking the Janumet because of the side effects that came along with it (unpredictable diarrhea). I told my doctor that I wanted to get off this medicine and find a way to get my blood sugar measurements in the normal range for someone without Type 2 Diabetes. He politely told me that I should get used to taking these 2 pills every day because this problem was genetic for me (my dad and most of his brothers also had Type 2 Diabetes). My doctor didn’t know me too well and he didn’t realize that I am not wired to accept the status quo without doing my due diligence first! 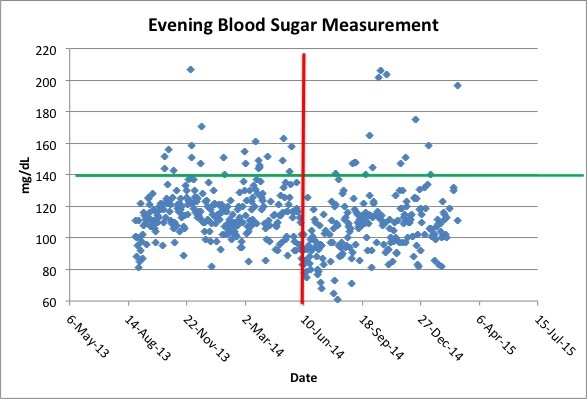 Thanks to a comment in that 4-month post diagnosis blog post, I was turned onto a study that showed how people could have normal blood sugar measurements without medication. That study, found here, was the 1st trigger that started me on a longer and deeper study into how our bodies operate and how the types of food we eat and the lifestyle we choose affect our overall health more than genetics. After a month of research I decided to try this low calorie, low carbohydrate diet for a few weeks to see if it would work. What did I have to lose? My current lifestyle was being compromised due to the side effects of the Janumet so going off the meds for a few weeks and suffering through this very restrictive diet was a small risk considering the possible benefits the study promised. As I wrote about here, I only needed to stay on that diet for a week before my blood sugar measurements were within the normal range of someone who didn’t have Type 2 Diabetes. And all this with no medication! It should be noted that I lost another 10 pounds during the week I was on this diet and for all intents and purposes I was back to my ideal weight for my body type. It was during that time I was on this diet that a co-worker mentioned the Paleo diet as a way I could eats foods that controlled my blood sugar levels but also allowed me to exercise and function normally (because living on 700 calories a day, as the diet prescribed, is no way to go through the rest of my life). This was the second trigger that started me on a journey that led me to a lifestyle that allowed me not to just survive but to thrive. I read Robb Wolf’s “The Paleo Solution” and slowly over the course of several months adopted that lifestyle. I say “lifestyle” instead of “diet” because Paleo is a lifestyle change. It’s not only about the diet of eating only natural meats, fruits, vegetables, seafood, nuts, seeds and healthy fats, it’s about getting enough sleep (at least 7 hours), exercising the right way (lift heavy stuff and run fast) and simplifying your life by eliminating unnecessary stress. My adoption of the full Paleo lifestyle starting when I eliminated grains, then a couple months later I eliminated legumes and processed food and I finished up by eliminating all dairy products and adding daily fish oil pills to my diet. During this journey I also altered my exercise routine to add high intensity workouts and tried as best I could to get at least 7 hours of sleep every night. The results speak for themselves – A1C is normal for someone without Type 2 Diabetes, I’ve lost 25 pounds since my diagnosis, cholesterol and other markers are all normal and I now have the energy I had when I was in my 20’s (I’m comfortably in my 40’s now!). 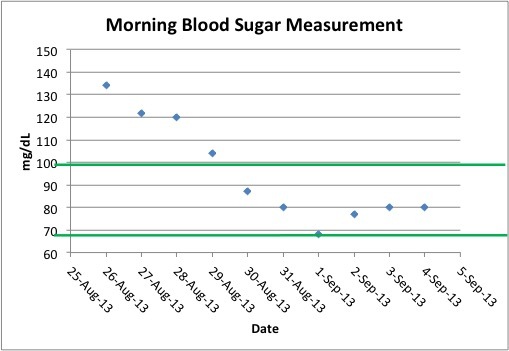 I still can’t explain the drastic step function drop in blood sugar measurements that I saw in June 2014 (as outlined here) and as you can see from the graphs below (the green line shows a normal reading for someone without Type 2 Diabetes), this change was permanent and not transient. I can only hypothesize that after months on the Paleo lifestyle my body “reset” in some fashion where my insulin sensitivity improved. It pains me that I can’t assign a cause to this but I’ll still take the benefit anyway! If there is anyone who is coming to grips with their Type 2 Diabetes diagnosis, I hope this post finds them and they can learn from me as I have learned from others how to improve my life without medication. A Type 2 Diabetes diagnosis is not a death sentence but instead a wake up call for those who are willing to confront the brutal facts, analyze the data and adopt a lifestyle that complements the way our bodies were designed. This entry was posted in Diabetes, paleo. Bookmark the permalink. Cheers! I think you, in some way, reset your body’s processing of your new diet. Keto-adaptation? I have read that those who are keto-adapted run lower blood sugars than normal (60-80). There was a study on those keto-adapted. Their blood sugar was tested, then they were given injections of insulin! Blood sugars dropped to 40! That is coma time from hypoglycemia. But those in keto-adaptation do not need that much sugar in their blood. They stay healthy on much less. So when the blood sugar dropped, they remained alert, oriented and pretty well. That was amazing. That is very interesting Tannngl! I love hearing about things like this. And you may be right, I think something in my body switched abruptly.